After months of talks, the United States and China have reached a landmark agreement on climate change that is a potential game changer in international negotiations to stave off global climate catastrophe. Although naysayers have begun attacking the deal in earnest, the surprise November 11 announcement of the agreement undercuts one of the main arguments of those on the right who believe that climate change is a hoax and who are dead set on delaying any action on the issue: namely, that U.S. efforts to cut greenhouse gas emissions would be worthless without serious commitments from China to reduce its emissions. As one conservative commentator noted before news of the deal broke (ironically, in hindsight): “You could shut down every coal mine in Kentucky, it won’t make a dime’s worth of difference. If [President Obama] gets an agreement with China, which he won’t, but that’s the one area it would be historic.” As it turns out, pessimists can’t always predict the future. By way of their joint agreement, President Obama and President Xi Jinping have unequivocally signaled that transitioning away from fossil fuels to clean energy need not be a zero-sum game between rivals, but can and should serve as the basis for international progress. Under the terms of the agreement reached in Beijing, the United States “intends” to achieve an economy-wide target of reducing its greenhouse gas emissions by 26-28% below 2005 levels by 2025 and to make “best efforts” to reduce emissions by 28%. China “intends” to achieve the peaking of CO2 emissions “around” 2030 and to make “best efforts to peak early,” and intends to increase the share of non-fossil fuels in primary energy consumption to around 20% by 2030. These commitments may be framed in the tentative language of international agreements, but in the context of international negotiations, their timing and specificity are striking. In the near term, the announcement is a major shot in the arm to the next stage of international climate negotiations. Instead of predictions that the next conference of the parties to the United Nations framework agreement on climate change would be mired in uncertainty, the talks in Lima, Peru next month will resume on a much stronger note. The U.S.-China deal may serve to diminish traditional animosities among nations tied in part to past unwillingness of the United States and China, the world’s two biggest emitters, to adopt more stringent measures to control their pollution. The deal is also a welcome injection of leadership into the negotiations in advance of the major UN climate conference to be held in Paris, France in 2015. Moreover, China just announced today that it will cap its coal use by 2020 in order to meet its commitment under the new agreement. 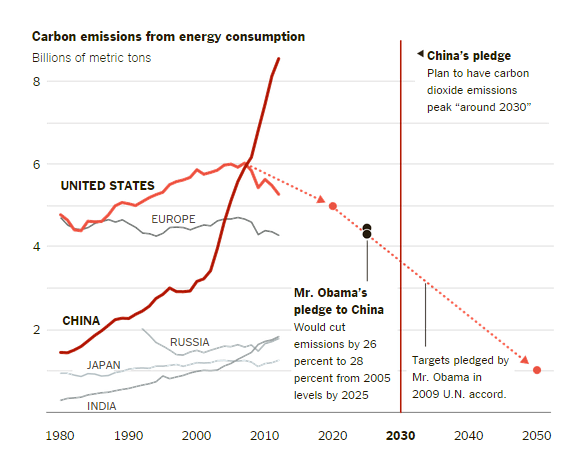 This announcement is a game changer in its own right and “utterly refutes” the recent claim by Sen. Mitch McConnell (R-KY) that the deal “requires the Chinese to do nothing at all for 16 years.” On the contrary, placing a cap on coal use is arguably the single most significant step China has taken to curb its emissions to date. It is unlikely that the Chinese government would pledge, on the world stage, to “make best efforts to peak early” if it were not prepared to back up that pledge with action. All this leaves the ball in the United States’ court. Its 26% emissions reduction target is likely only achievable through both the Obama Administration’s existing regulations on vehicle emissions (the transportation sector accounts for roughly 30% of U.S. greenhouse gas emissions), as well as through the more recent and highly contentious regulations on pollution from existing power plants under Section 111(d) of the Clean Air Act (the power sector accounts for nearly 40% of U.S. emissions). Therefore, whether the next U.S. administration upholds or rolls back these efforts will likely determine the fate of what may be the last best chance to reach a global climate deal before it is too late. The stakes for the 2016 presidential election could not be higher – for the United States, or for the world.